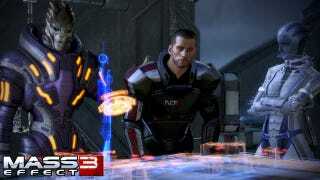 The two men who won an early copy of Mass Effect 3 this weekend may have broken both state and federal laws by trying to raffle it off. Two weeks ago, publisher Electronic Arts took copies of the sci-fi role-playing game and launched them into space on weather balloons. GPS devices were attached to each balloon, so dedicated fans could track down landing points and get their paws on early copies of the highly-anticipated game, which comes out for PC, Xbox 360, and PlayStation 3 on March 6. This past weekend, videomakers Michael Davis and Miguel Droz uncovered a copy of the game in the Arizona desert. On Sunday, they decided to raffle it off. Interested gamers could pay $5 for a ticket and a chance to get the winning number, as determined by a random generator. Davis and Droz said that 30% of the proceeds would go to the Child's Play charity organization — and that the rest would go to the video game company they hope to open. But by choosing to raffle off the game and keep some of the proceeds, Davis and Droz may be subject to "potential criminal penalties" that may include jail time and a very large fine, says attorney Mark Methenitis. According to state law in Nevada, where the pair say they are based, lotteries are only legal if all of the funds go to charity. "They're running an illegal lottery which subjects them to potential criminal penalties." "You can pretty much never rely on a charitable gaming exemption unless 100% of the money goes to a charity (though you can often use part of the funds to cover event costs, ie dealers at a charity casino night)," Methenitis said in an e-mail to Kotaku. "Diverting the funds here is about as clear cut as you can get; they're using the funds for personal gain." Though Methenitis does not practice in Nevada, he says he has experience with similar laws in other states. In addition, since Davis and Droz are accepting entries across U.S. state lines, Methenitis says it's both a state and a federal issue. "In short, they're running an illegal lottery which subjects them to potential criminal penalties," Methenitis said. "I would imagine that Child's Play, if they knew what was going on, would not want to be involved. I won't even get into the issues with the IRS that could come up here." Although Davis and Droz say they will match whatever they earn by donating that amount to Child's Play at some point within the next few years, Methenitis says that's irrelevant. The raffle is still illegal. "It's often a felony, which usually means something like 1-10 years in prison and/or a fine (usually in the thousands to tens of thousands range)," Methenitis said. Kotaku has reached out to both Child's Play and Electronic Arts for comment. We were actually unaware of the legal ramifications before we started this. At first we actually thought it would be a great idea for a great cause. Just because of that, and us not wanting to get into any hot water, we'll be giving all of the donations to Childs Play. So as of now we are officially cancelling this entire thing, and refunding everyone's money through PayPal. Sorry about that, we should have done our homework first, but in the rush to get this done, hopefully do something cool for charity and get ourselves a kickstart to start our company, we just didn't do our due diligence. Again, we super apologize for wasting anyone's time. Although we can't stop anyone from donating to Child's Play, this group reached out to us over the weekend and we had not yet been able to decline the offer to participate. As a policy, we only promote fundraisers that benefit Child's Play 100%. Otherwise, we run the risk of partnering with fundraisers that look to leverage the charity for their own personal gain. We encourage anyone with fundraising questions to get in touch - jdillion@childsplaycharity.org.